On Thursday April 2nd, the Urban Alliance on Race Relations joined many community organizations and individuals to challenge the Community Engagement Report – a draft policy to replace the former “carding” program. The gaping holes in the new policy do not reflect any of the previous recommendations made by concerned community members. 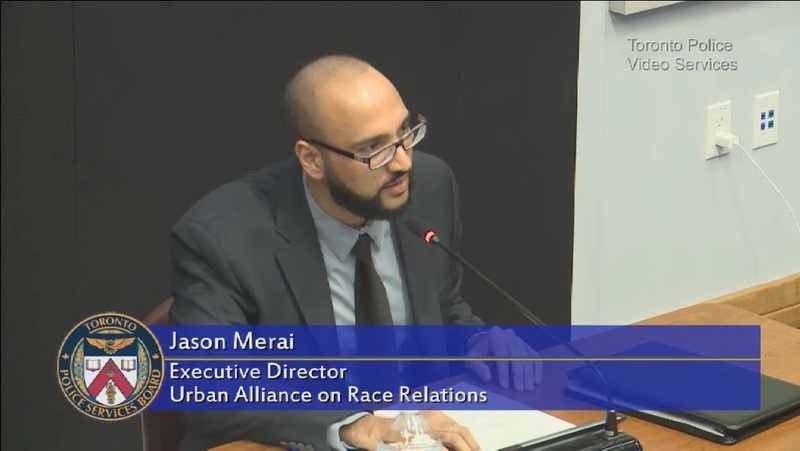 Below is the Deputation delivered by Executive Director Jason Merai to the Toronto Police Services Board. Viewing of Deputations can be found at http://rogerstv.com/page.aspx?lid=237&rid=16&sid=3431&gid=231773. The Urban Alliance on Race Relations (UARR) acknowledges the importance of the Toronto Police Services Board’s revised Community Engagement policy, which introduces specific guidelines to address the previous practice of targeting members of racialized communities. As it stands now, there are a number of significant questions that need to be asked in order for this policy to be consistent with human rights concerns. The revised Community Engagement policy states that it will not consider race, gender, gender identity, gender expression unless one or more of the factors are part of a witness description. However, these lived experiences are the reason communities have had issues with carding in the first place. Officers should take into account how these identities shape individuals’ experiences with police when interacting with individuals. Furthermore, a previous recommendation required that individuals be given a carbon copy receipt of their interaction with police. Now instead of receipts they will be given the police officer’s business card. What will happen to the personal information collected in this manner, and where is the accountability in such a transaction? With regards to personal data, what is not clear is reviewing and removal of past carding data. As the Community Assessment of Police Practices study noted, there are minors whose information is in that database. There’s the marital status of peoples’ parents, notes on peoples carding files that are barring them from getting jobs in the sectors for which they have earned an education. What’s more is that aspects of the policy still lack clarity. Particularly troubling is the broadening of the definition of public safety and the circumstances under which “carding” can occur. The new policy is much broader, and will inevitably result in a subjective interpretation by individual police officers to approach individuals at anytime. Finally, the previous policy included the requirement of officers to inform individuals of their right to walk away if they are not a part of the investigation. Why has this now been omitted? It is encouraging to learn that the Toronto Police Services Board leadership supports equitable community safety. As such we look forward to the Board’s leadership to immediately revise what can be considered a weak policy. Anything less would be unacceptable in building public trust and public confidence in policing in Toronto. Without these changes, the community engagement policy is simply carding 2.0. Thank you and happy to answer any questions you may have.